In celebration of FiberScene’s 10th Anniversary, we explore some of the recent work of the artists who inspired our website. We reaffirm our strong commitment to showcasing and promoting the work of San Francisco Bay Area Fiber Artists and gratefully acknowledge their continued support. Beginning with our recent exhibit of Virginia Davis’ gorgeous, cerebral work, we are offering 6-8 week solo Gallery shows. Our first 2009 show, February 1 – April 1, is devoted to Anna Lisa Hedstrom’s intricate shibori work, and that will be followed by Adela Aker’s beautiful linen and horsehair weavings, May 1 – July 15. 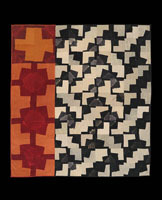 Ana Lisa Hedstrom uses shibori, the ancient Japanese art of resist dyeing. By binding, stitching and folding fabrics with unique variations on traditional methods, Hedstrom creates a myriad of patterns in cloth. 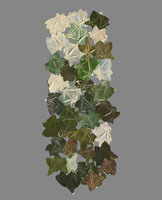 She specializes in arashi shibori, a technique that involves folding and wrapping fabric around a tube before placing it in a dyebath. 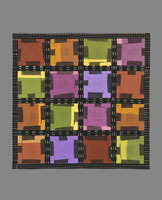 Depending on the pleating and binding, different striped patterns can be created. 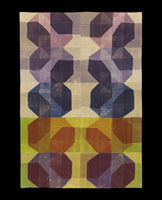 Hedstrom further manipulates her textiles by piecing together different shibori patterns to form intersecting lines and geometric shapes in dazzling jewel tones. Drawing on diverse themes ranging from music to global warming and the environment, she creates work with a sense of energy and movement. 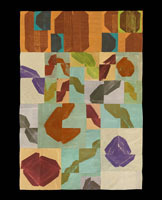 Pieces such as “Bebop” and “Riff” reference the frenetic action of jazz through shapes which seem to dance across the surface of the textiles. 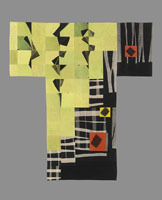 While Hedstrom’s work is heavily influenced by Japanese history, the final forms are uniquely American, owing to her use of quilting techniques and modern geometric forms. Her newest series of work, titled after the seasons, is a response to issues of global warming and man’s influence on the environment. Works such as “Spring” are created with polyester fabrics, which are manipulated and colored with heat-transfer dyes. The pieces of fabric emulate natural forms, encouraging the viewer to question the representation of nature in daily life. 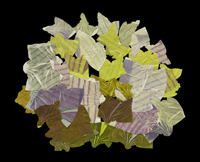 Hedstrom’s skilled use of color and pattern make these arrangements richly detailed and unique. Ana Lisa Hedstrom has taught at programs around the country, including Penland School, and the University of Minnesota Split Rock Arts program, Haystack School of Craft, San Francisco State University. Her work is held in the collections of several renowned public institutions, including the Cooper Hewitt Museum, the American Craft Museum, the Aichi Shibori Research and Study Archive in Nagoya, Japan, and the De Young Museum.